You are here: Home / Our Animals / Chickens / Chicken Feed / Alternative Feed For Chickens: Best Ideas! If you’re looking for an alternative feed for chickens that won’t break the bank and will help support your healthy flock, then you’re in luck – there’s an abundance of surprising alternatives! While your hens should always have a high-quality layer feed, you might find yourself without a bag one day (and the feed store might be closed) OR you might have table scraps you don’t want to toss. You also might want to make your own chicken feed. Nutritious feed doesn’t need to come with a golden price tag, but it does need to satisfy the hunger cravings of your beloved flock and provide much-needed nutrients and vitamins. Whether you want to craft your own chicken feed or just want to give your flock some treats, it’s always good to know what chickens eat! In this article, we’ll discuss the possible alternatives to your usual feed – and you might be surprised at our list of ingredients! What Is The Best Food For Chickens? What Can You Feed Chickens If You Run Out Of Feed? What Scraps Not To Feed Chickens? What Is The Cheapest Way To Feed Chickens? Do Chickens Need Food And Water At Night? What Vitamins Are Good For Chickens? What Can I Grow For Chicken Feed? Are Oats Good For Chickens? Is Peanut Butter Good For Chickens? The best chicken feed for laying hens is a high-quality 16% protein layer feed with a calcium supplement. For chicks (under 16 weeks), a high-quality 18% chick starter is best. The feed should have the required nutrition and vitamins for them to stay healthy and become consistent egg layers. Most commercial feeds make it easy. If you want to make your own layer feed, you can use my organic homemade chicken feed recipe here. While I never really recommend this, there’s plenty you can feed chickens without actually having to buy feed. You can feed them table scraps (there’s a table below of what human food they can eat), grow food for them (we have a leafy green garden for our flock), or raise mealworms or black soldier fly larvae. You can learn how to raise mealworms here and why black soldier fly larvae are healthy for chickens here. If you have a “corn hookup” you can feed them dry corn as well. One of our neighbors is a farmer. One year, his crew spilled a LOT of corn on the ground. He didn’t want to clean it up, so he asked if we wanted it, LOL! It’s best to feed a 16% protein layer feed however – you want your chickens to be healthy and lay eggs consistently. Nine times out of ten, when a reader emails me because her hens have stopped laying, diet is the reason why. Chickens can eat so many things – it’s probably easier to talk about what they CAN’T eat! Chickens especially seem to love protein – insects (alive or dead) are HUGE with backyard chickens. They also love seeds such as sunflower, wheat, or hemp seeds. Of course, fruits and vegetables are popular, too (especially corn)! As for leafy greens, it’s best to stick with lettuce, kale, and spinach. Alternative feed for chickens if you’re out of feed are whole grains like wheat, corn, flax, cooked rice (NOT UNCOOKED! ), and raw or cooked oatmeal. Protein-rich foods like cheese, plain greek yogurt, and sunflower seeds are also good choices. Most table scraps you have on hand will also be suitable as an alternative. Bugs like black soldier fly larvae (which are remarkably easy to cultivate), worms, and crickets are options as well. Just be sure to steer clear of beans! What chickens eat naturally (and that will cost you next to nothing) is food you can produce in your backyard, such as green plants, vegetables, fruits, and seeds. Chickens will also naturally hunt for insects such as earthworms, slugs, grubs, black soldier fly larvae, and other creepy crawlies. This alternative feed for chickens is cost-effective, full of protein, and can be found in their natural habitat. However, before attempting to use any of the above as dinner for your flock, you should be aware of what food can harm to your flock if you’re considering an alternative feed for chickens. Bad food such as salt, sugar, coffee, or liquor and any uncooked raw or dried beans, raw green potato skins (which can contain a poison called solanine). Onions also are a poor food to give to chickens. The cheapest alternative feed for chickens would be using table scraps that don’t include anything moldy or rotten. Other free chicken feed ideas are insects such as grubs, mealworms, or black soldier fly larvae (or crawfish, if they’re in your region). Mixing your own non-gmo organic chicken feed is another option, especially if you can bulk buy ingredients at a lower cost. We have an article about making your own homemade chicken feed here. Chickens typically only eat food and drink water when they are awake during the day. At night, chickens prefer to roost and get some sleep. However, there’s nothing wrong with leaving food and water in the coop overnight (especially water) if you don’t have a rodent problem. You should always make sure the feed won’t attract predators. A chicken feeder that automatically closes at night is always a good option. Like people, chickens need all the vitamins they can get. Vitamin and mineral deficiencies can produce numerous health problems for chickens (including poor egg production), so it’s important to feed them a balanced poultry diet enriched with vitamins A, D, E, K, B12, Biotin, Thiamine (B1), Riboflavin (B2), Niacin, Choline, Folic Acid, and Pantothenic Acid. Also, minerals such as calcium, iron, magnesium, copper, iodine, zinc, cobalt, phosphorus, and, manganese are important. Most commercial chicken feeds have all the vitamins and minerals your hens need. To ensure your flock has enough calcium to produce good eggshells, you can offer an additional supplement like oyster shells. You can grow garden cover crops such as alfalfa, clover, buckwheat, and annual rye. In your garden, you can grow tomatoes, leafy greens like kale or spinach, wheat (can be sprouted into fodder), bell peppers, sunchokes (boil and mash to feed), corn, and herbs. Just remember that you will need to feed your chickens year round, so if you want to grow feed for your chickens, have a plan to preserve some. Other chicken feed ingredients you can grow are wheat and millet. If you’re wondering what to feed chickens to lay eggs, it’s important to give your flock plenty of protein. So, if you really want to grow your own chicken feed, it’s a good idea to also raise mealworms or other insects so your hens have plenty of protein. Ideally, you should feed your chickens about 1/4 pound of feed per chicken per day, or, 1.5 pounds of feed per chicken per week. Environmental conditions, such as whether it’s very hot or very cold, can also effect how much you should feed your flock. In the winter, you’ll likely want to increase their rations so they can produce enough body heat. If your flock isn’t laying eggs consistently, you’ll want to increase their diet, as well. Typically, chicken feed 50-pound bags are sold at stores to make it easier. Yes! You’ll read varying opinions about this, but oats are perfectly fine to feed your flock. You can feed them dry or made into a mash. Quick oats and instant oats are fine as well – just make sure they’re plain, and without any extra preservatives or ingredients. During very cold nights, many owners make their chickens oatmeal to give them extra energy at night. In the summer, you can mix oatmeal into frozen suet cakes. A great alternative feed for chickens are bugs – chickens love them! While there are many critters hens love to eat, cockroaches are one of them! If you raise cockroaches, then you’re in for a treat. Chickens love chasing them, and they’re full of protein. While peanut butter (natural, no salt, no added ingredients) is okay for chickens to eat, it’s not the best for them. A high-quality layer feed is better. However, there’s nothing in peanut butter that will hurt them, as long as it’s 100% natural with no salt or added ingredients. Honey is also healthy for chickens, so you can mix it with honey if you want! 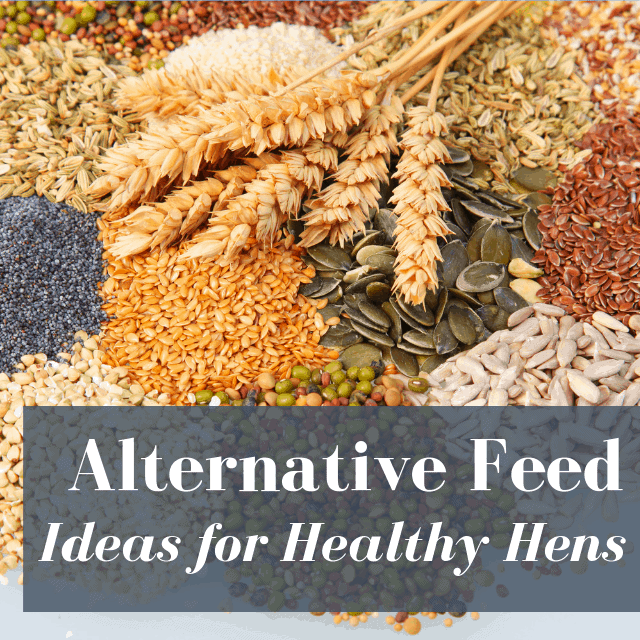 There’s a lot of alternative feed options for backyard chickens. However, it’s important to make sure your flock has the right amount of protein, vitamins, and minerals in their diet. Otherwise, you might not get as many eggs! What’s your favorite alternative feed for chickens? Leave a comment below! If you’re looking for an alternative feed for chickens that won’t break the bank and will help support your healthy flock, then you’re in luck - there’s an abundance of surprising alternatives! This is a very interesting read. I r sally enjoy finding out the does and fonts for my chickens safety. I wonder do you have a book with this information. I’m thinking about asking a brewery that is nearby for their spent grains. What do you think of that? You can try. Dried distillers grains are in a lot of commercial feed products. When our weather is not too hot and wet, I will throw shelled unsalted unroasted organic sunflower seeds into a horizontal tight mesh suet block holder in the garden. They usually sprout within 2 to 3 days, they’re not sitting in water, and then I’ll throw them on the ground for the chickens. They love them! Also, when we have tons of eggs in the summer, I will hard boil about one per chicken, mash them up shells and all, let them cool, then put them out for the chickens to eat. Sounds great! Mine love sprouted seeds, too!